The gardeners exchange program was put to life by Loki Schmidt. More than 20 years ago a gardener of the Botanical Garden of Hamburg went to Jerusalem to help planting the tropical glasshouse there. It was the first of its kind in Israel and there was little experience with it. Loki Schmidt was then financing it to get the gardener exchange on its way. Actually without Loki Schmidt no exchange would be possible since then. From Jerusalem to Hamburg, from and to St. Petersburg and Merida in Venezuela and many more trips have taken place. New friendships where born from continent to continent. Time after time formal structures and rules developed. 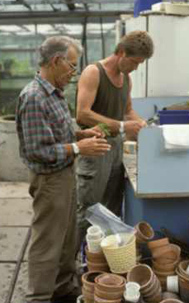 In 2002 Brunhild Kühl donated a reasonable amount for the international foundation of gardeners to get Loki Schmidt’s idea on a financial basis to continue.